The Columbus Indiana Philharmonic Chorus has been an important element of the Philharmonic programming since the first concert in 1987. Singers range in age from high school students to senior citizens. Under the direction of David Bowden, the Chorus performs works ranging from classical to musical theater; from oratorios, requiems, and opera to holiday favorites; and from middle ages to modern. Participation in the Chorus does not require an audition. Anyone who can read music, finds pleasure in the teamwork of choral participation, and is willing to strive for musical excellence is encouraged to join. 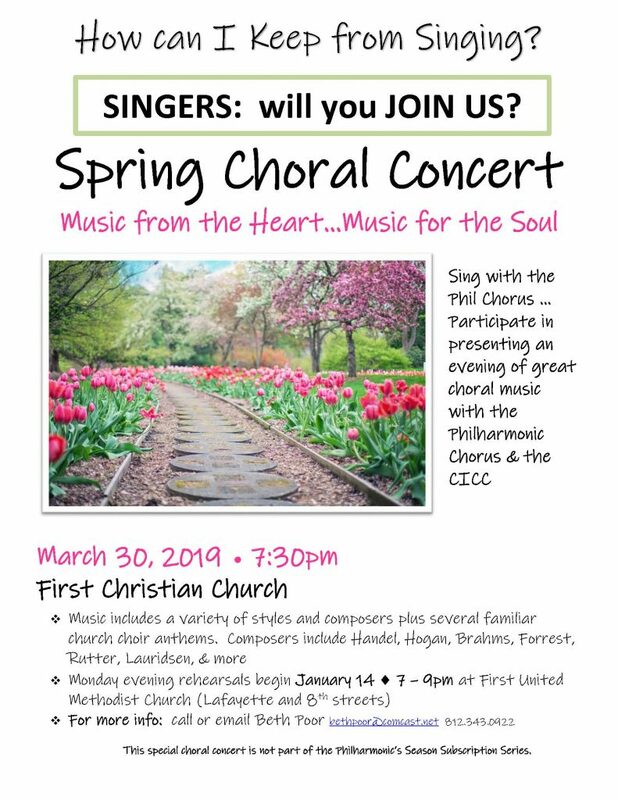 Rehearsals are now underway for the March 30, 2019, Spring Choral Concert, “Music from the Heart…Music for the Soul.” For this concert, the Philharmonic Chorus will join the Columbus Indiana Children’s Choir to present an evening of great choral music in the wonderful acoustic space at First Christian Church in downtown Columbus. Interested singers are encouraged to attend several rehearsals simply to “check out” the ensemble and see how they like the “fit.” There is no obligation. The chorus has an excellent reputation for inclusion and fellowship. Many find the camaraderie of the group and the joy of making great music with wonderful singers and an outstanding professional orchestra quite rewarding. Check it out! Rehearsals are Monday evenings from 7:00 – 9:30 pm in the second-floor rehearsal room of First United Methodist Church (8th and Lafayette in downtown Columbus).